Q. 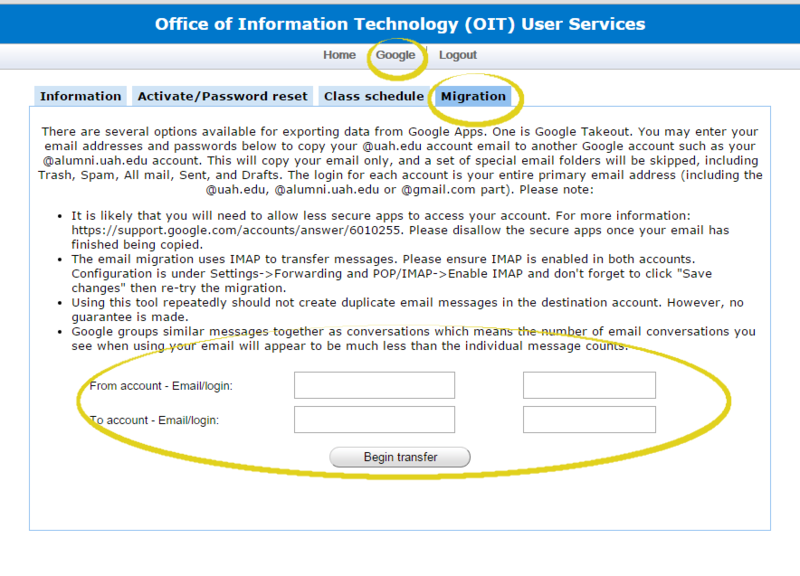 How do I migrate my email from my student account to an Alumni Account? One of the benefits of being a UAH alum is that you get to have an Alumni email account (using the @alumni.uah.edu) permanently [well, as permanent as anything electronic ever is]. If you have not taken advantage of this, and are an alum, then see the Alumni Email Address page to fill out the form and make the request. Once you have gotten your confirmation and set up your account [this might take a few days], you are ready to proceed with the migration. There are a small handful of steps you must make sure to have done to prepare both email accounts - your original student email address and your new alumni one - before you can migrate the email. The first step is to set both accounts to allow less secure apps. 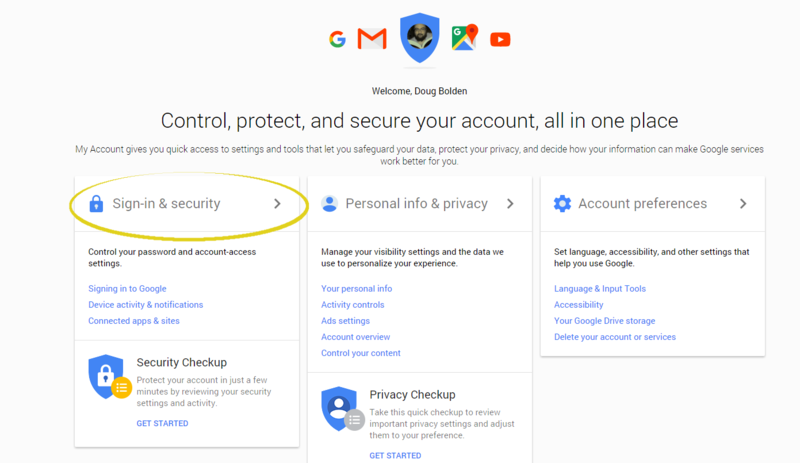 To do this, go to your email account (doesn't matter which account you set up first) click your user icon in the upper left corner, and then choose "My Account". 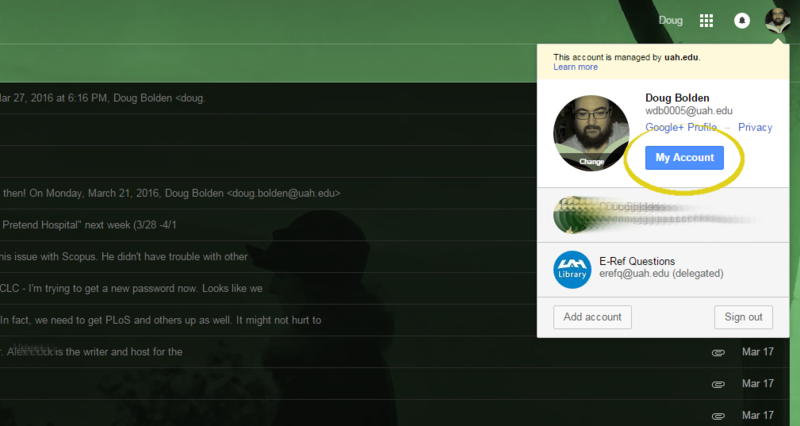 Then you will be taken into an account settings screen. From there, choose Sign-in & Security >. Then scroll all the way down on that page until you see an option marked "Allow less secure apps". It defaults to OFF. Click the toggle to set it to ON. You do not have to click save, it will do that automatically when you toggle it. Again, you must do this for both accounts. 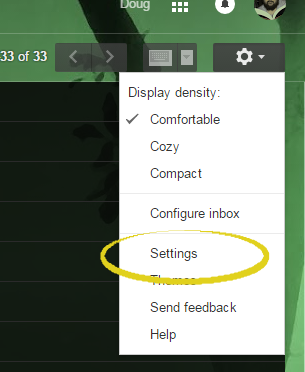 Now that you have done that, you will return to your GMail window and this time click on the little gear icon and then choose "Settings" from the drop down box that shows up. 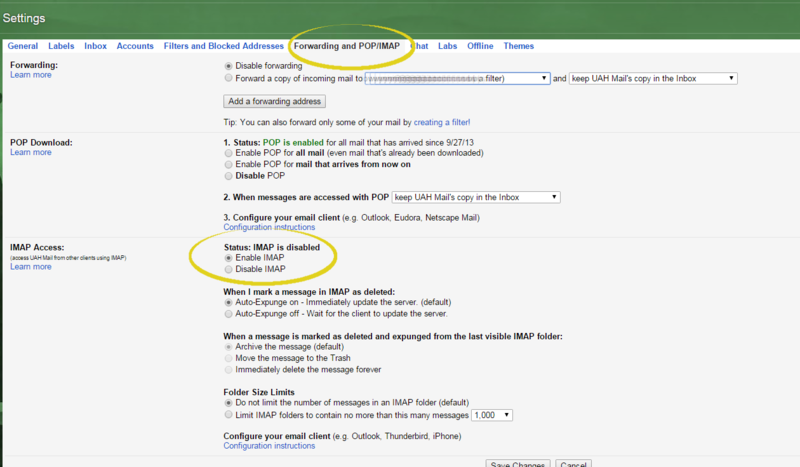 Once you get to settings, click on "Forwarding and POP/IMAP". Now, look down that page until you see "IMAP Access" and set it to Enable IMAP. Once you click enable, you must save changes. Once more, this is for both accounts. Once you have both account set to allow less secure apps, and have both to set to allow IMAP, the next step is to actually migrate the emails. You will log into the OIT Self-Service Portal and login with your LDAP credentials (even as an alumni, use your username and password that you used as a student, not the one you set up with your alumni email account). Once there, click on the Google "tab" (more like a link about the middle of the top of the page) and then click the migration tab. You will now enter both of your email addresses and their log in. The "From account - Email/login" is your student email. The "To account - Email/login" is your alumni email address. Then click begin transfer. You have your alumni email account full set up and can log into it. You are using the abc0123@uah.edu formation for the UAH email account and the abc0123@alumni.uah.edu for the alumni email address. If you have waited for more than a year or so, it might be that your emails from your @uah.edu account have expired. Make sure both the @uah.edu and the @alumni.uah.edu accounts are set up to use less secure apps. Make sure both the @uah.edu and the @alumni.uah.edu accounts are set up to use IMAP. If you have checked all of those things, maybe wait a few minutes and try again. 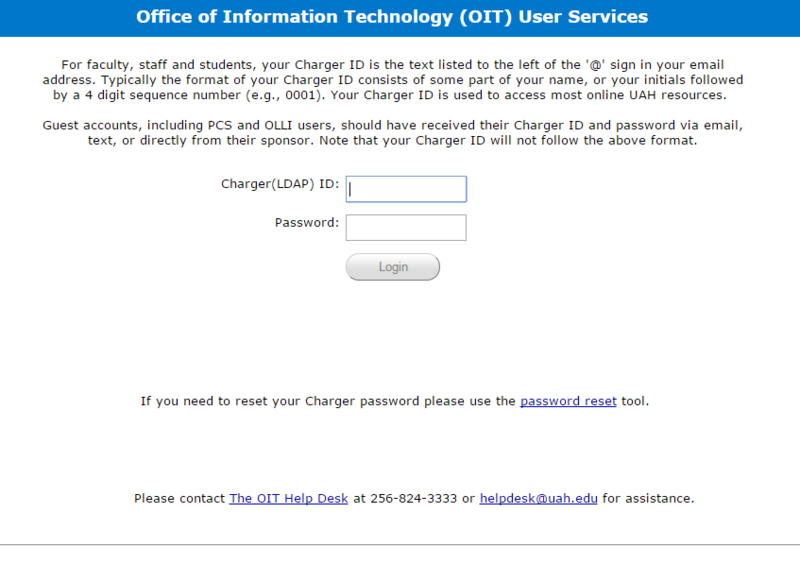 If that does not work, you can contact OIT via phone at 256.824.3333 or by email at helpdesk@uah.edu. Can I Migrate to a non-Alumni email address? Yes, you should be able to do so. Note: non-apps account emails do not have the "less secure apps" step, so you can probably skip Step One, above [though maybe they do, so if it doesn't work, go back and double check that]. Do the 2 email accounts merge? Or do messages sent to the uah.edu account get forwarded to the alumni.uah.edu account? by Anonymous on Nov 30, 2016. They do not merge in that sense. You can set up an automatic forward while your student account is still active, but once it expires, emails sent to the @uah.edu version will bounce back. I would recommend you set up an auto-response that says something like "Please update my email address to [chargerid]@alumni.uah.edu" as well as the forward to catch those that email you frequently. Or send out a mass email to your frequent contacts before it expires. by Doug Bolden on Dec 01, 2016.